When you filter a view, you're excluding information you don't need to see so you can focus on what you do need to see. For example, if you want to see only tasks that use a particular resource so you can more closely analyze the workload, you can apply the Using Resource filter. Or if you're about to attend a status meeting and you want to discuss tasks that are either in progress or not started, you can apply the Incomplete Tasks filter to a task sheet. You can also apply filters to a resource sheet. 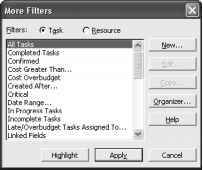 If you want to examine all resources that are running over budget, for example, you can apply the Cost Overbudget filter. Or if you want to see only your material resources, you can apply the Resources - Material filter to a resource sheet. 1 Display the view whose information you want to filter. You can filter information in all views. 2 Click Project, Filtered For. 3 If the filter you want is listed on the submenu, click it. If the filter is not in the submenu, click More Filters and then find and click it in the More Filters dialog box (see Figure 4-22). Click Apply. Figure 4-22. The More Filters dialog box lists all built-in filters. 4 Some filters require you to enter more information. For example, if you choose the Should Start/Finish filter, you need to enter start and finish dates and click OK.
By default, a filter excludes tasks or resources that do not meet the conditions of that filter. If you prefer, you can instead have the filter highlight tasks or resources that do meet the filter conditions. Click Project, Filtered For, More Filters. Click the filter you want and then click the Highlight button. 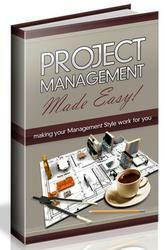 To remove a filter and show all tasks or all resources again, click Project, Filtered For and then click All Tasks. You can also use the Filter tool on the Formatting toolbar. Display the view you want to filter; then use the tool to click the filter you want to apply. When finished, click the arrow in the Filter tool and select All Tasks (or All Resources). 1 Display the sheet view whose information you want to autofilter. 2 On the Formatting toolbar, click AutoFilter. The AutoFilter arrows appear in each column heading in the sheet view. 3 Click the arrow in the column whose information you want to filter by and then click the value you want to filter by. For example, suppose you are displaying the Gantt Chart with the Entry table applied. If you want to filter for all tasks scheduled to start next month, click the AutoFilter arrow in the Start column and then click Next Month. When an AutoFilter is applied, the column heading changes color. 4 To show all tasks or resources again, click the AutoFilter arrow in the applied column heading and then click All. The AutoFilter arrows remain handy in the column headings for all views throughout your project plan until you turn AutoFilter off. With AutoFilter on, you can always quickly filter tasks or resources in a sheet. If you want to turn AutoFilter off, click the AutoFilter button again.